I can't help it, though; I'm on a crafting high, people, and I am riding this binge through to its inevitable, sawdust-covered end. MWUAH-HA-HAA. Simple, the linen matches our bedding, a hinged lid for storage, and only $15! SOLD! Trouble was, as you can see, it was way too low. 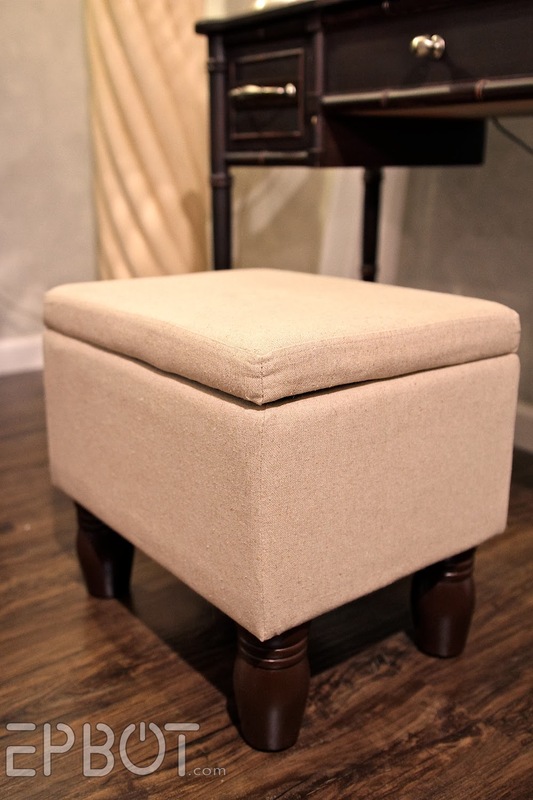 ... drilled holes in the new ottoman, added a washer and nut on the inside to hold the legs in place, stuck new felt pads on the feet, and... voilá! 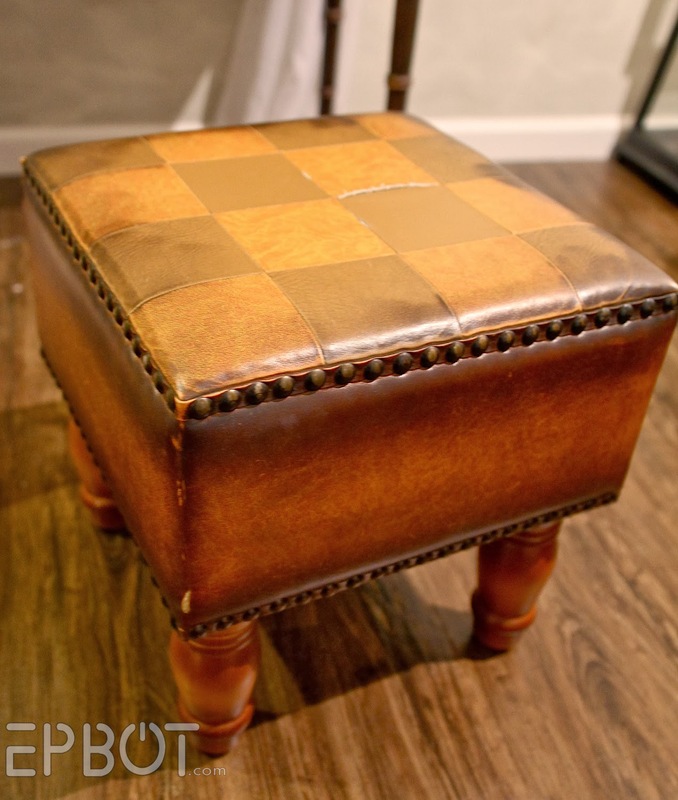 A new vanity stool for less than $20! "Now witness the power of an (almost) fully armed and operational... Rocking AT-AT." Actually, we still have a fair amount of work to do to make it safely ride-able: John's adding foot pegs tonight, and we're testing out different kinds of metal handlebars. And it may get a padded seat. Once all that's figured out: paint! Fingers crossed this works; I usually don't post projects 'til they're done, since I'd hate to admit how many never get finished, or just flat don't pan out. Heh. Still, this has come together in only about 3 days, and I'm particularly proud of the legs, since those angles took a lot of finagling. Hope it gives you guys a smile, anyway, and of course I'll post finished shots when (and if! 0.o) I have them! Oh yeah, and there's some kind of football thing happening this weekend, huh? Well, happy Footballing, if you're into that, and happy weekend to all the rest! 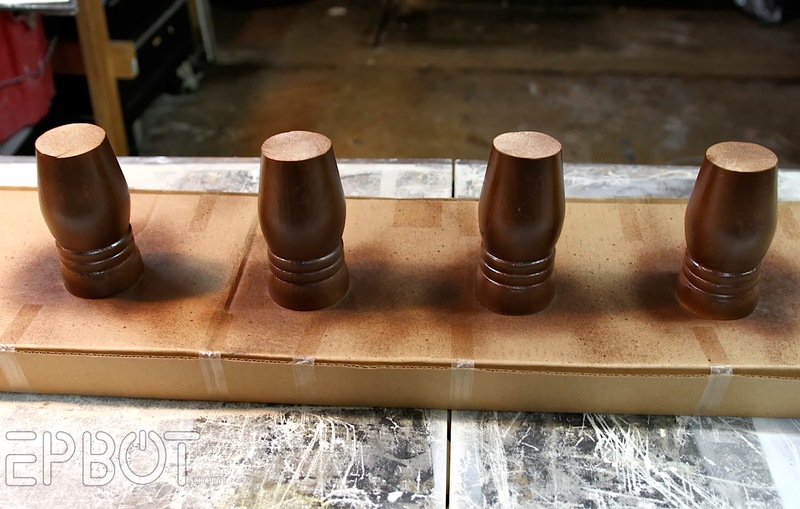 That is fantastic rocking AT-AT, I hope you post more pictures when it is finished "I find your lack of faith (in finishing) disturbing Commander"
Maybe go with a solid colour or use one of the funky stains/varnishes that are out there for the 'frame'? Oh wow - the AT-AT is AMAZING!!! My grandbaby would love that!! Loving all of the projects going on - nice. 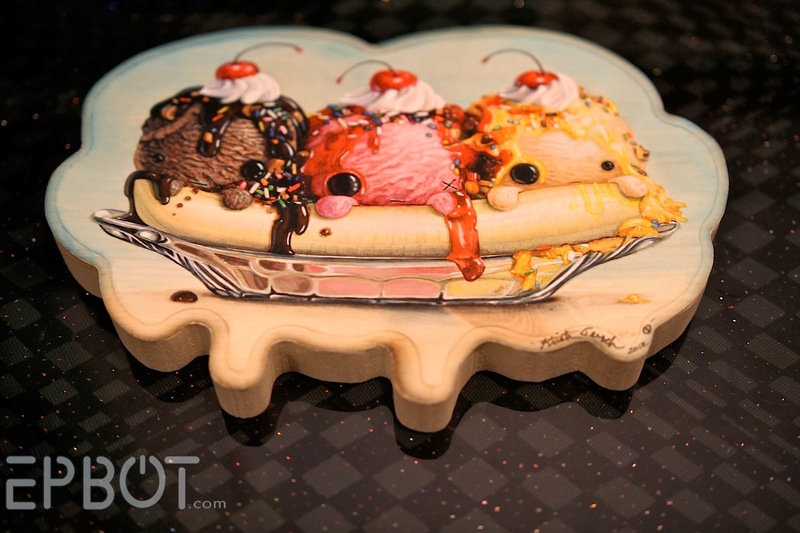 I like the idea of painting/staining the wood around your ice cream print to make a contrast- seeing that someone put a lot of work into a piece of art or craft is very visually appealing. 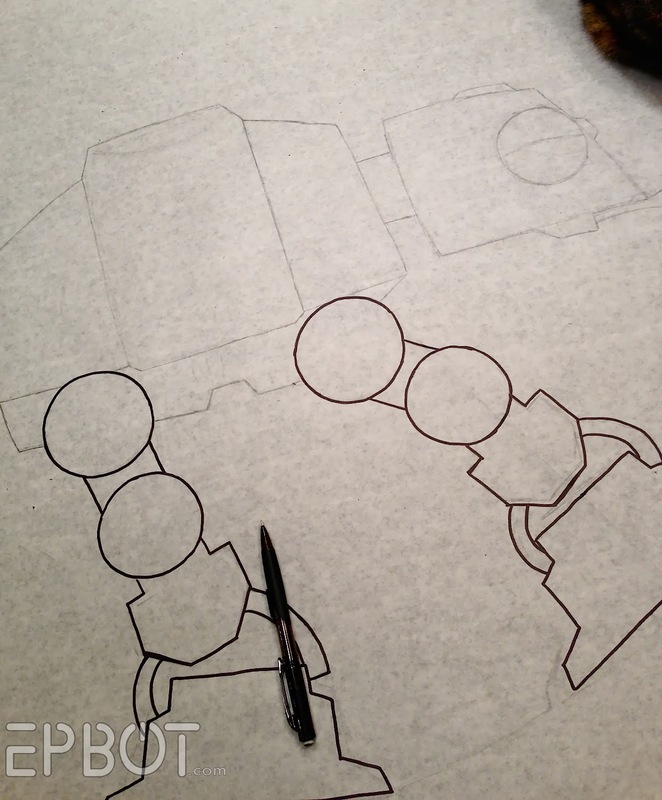 I really hope you finish the AT-AT so that I can bug my brother to make one for his future niece/nephew in a few years. OH MY GOSH THE AT-AT! I know a 22 year old guy who would love that thing! Quick someone photoshop smiley faces on those wood muffins. Stat! I love the idea of matching the wood edges to the banana art!! And the AT-AT rocker blows my mind! So cool! Oh my god. 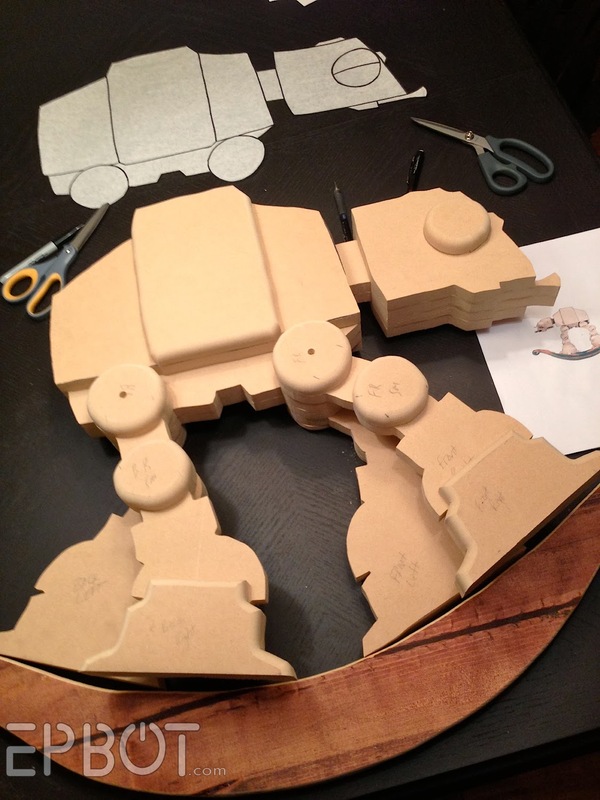 The AT-AT Rocking Horse(?) is amazing!!! Can't wait to see it all painted and enthusiastically riden! Squuuuueeeeee!!!! The AT-AT is adorable!!!!! Loving the AT-AT. Seriously. But, as a mother of a one year old rocking-animal enthusiast (hers is the ikea Elk) it's screaming unsafe at me. If it's intended for actual use you need to add some sort of support for the child's back and front. Like on a saddle. Them kids go crazy when they rock. Whot she said. We made a rocking dragon for the rug rat back in the day and the saddle is a must. As long as it's smooth and shaped to fit a kid's backside you don't actually have to pad it: it keeps the rocking sessions from going on too long :-) If you can swing foot rests that'll make it more fun for the kid. Aw, thanks, Tangeria! I know that feel; I'm the same way when I see stuff from the bloggers & online friends I follow! I'm usually more of a lurker than a responder, but I have to say: a rocking AT-AT!? WANT!! The AT-AT is completely amazing. Now if I could only get someone to make me a rocking K-9 for my own little Sarah Jane when she gets older *hmmmm* Off to scour the internets and plot. Sawed off leg bits = 1 UP mushrooms. OMG!!! I LOVE that AT-AT rocker! So much! My word working skillz are quite lacking, but this project makes me want to improve them so I can make one. Right now!!! The rocking AT-AT did not give me a smile. It gave me an open jaw "gasp, OMG, HOW! ?, Ugh I hate you people for being so awesome! Oh wow. I want that." That's what it did to me. OK, then I smiled. Wow. Just wow. The AT-AT is darling! You guys are so creative. Thanks for showing it "in-progress." SO TOTALLY AWESOME!!! Can't wait to see it finished!! Oh my gosh! That AT-AT is freakin' AMAZING!! You guys are geniuses! Can't wait to see it done. And yeah, it didn't just make me smile, it made me squeal like a little girl! Too cool. Your energy and talent make me green with envy! You guys are awesome! STEAMPUNK OWL I found it at Hobby Lobby in their Spring 2014 section that was on sale for 30% off; and they have crickets and frogs and all kinds of steampunk'd critters that I know you would love. Sorry to be so very very off topic but I had to show you! Ack, I love him! Aaaand now I think I have to go search my own store! OMG - I love that owl! And since today is #SuperbOwl it's right in theme! I'm going to have to find a friend that has a hobby-lobby nearby! Well, crud - there goes my tax return! I have to stop in there tonight and see if they have any in my local Hobby Lobby. Thanks for posting! Oh my goodness, LOVE that rocking AT-AT!! So cute! The muffins! The art!! The AT-AT!!!!!!!!!!!!!! Thank you for making my 12 hour work day so much better. I cannot wait to see everything finished. Thanks for the inspiration to work on some of my stuff today! I hope to see mor AT-AT photos soon......and dare I hope plans/tutorial/how to tips. :) Fingers crossed. I'd paint the edge with that cherry red, to make those pops of color pop even more. The AT-AT is adorable. Wish my hubby were a bit handier in the garage. 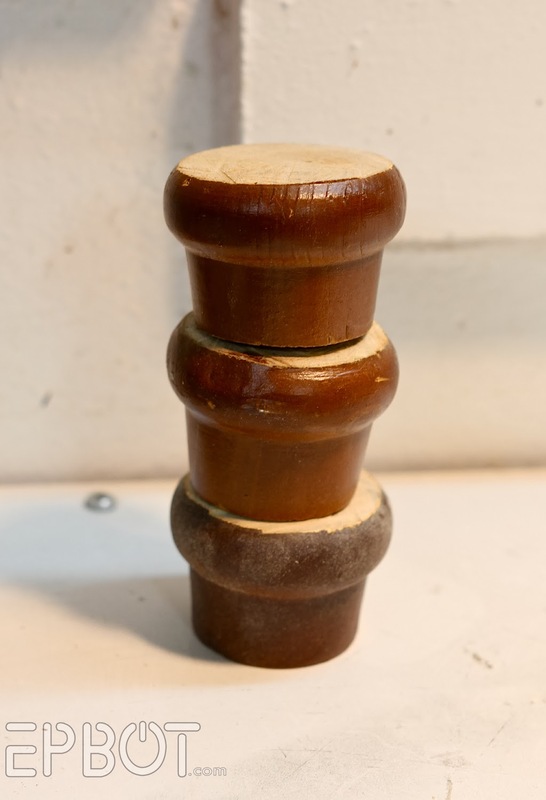 We have no shortage of awesome ideas, but we do run short on ability with power tools! I agree, I think contrast here would make the art stand out even more. Love the same-shaped mounting, great idea. I've never used a scroll saw so I've never dealt with a blade snapping on one but if it's anything like the blade on a band saw simply coming off the track in the middle of using it I believe you. Terrifying. Also, that ATAT is Un-freaking-believably cool. I think it even beats the Tauntaun rocker that I recently saw. Is it actually intended to be ridden or is it just decorative? 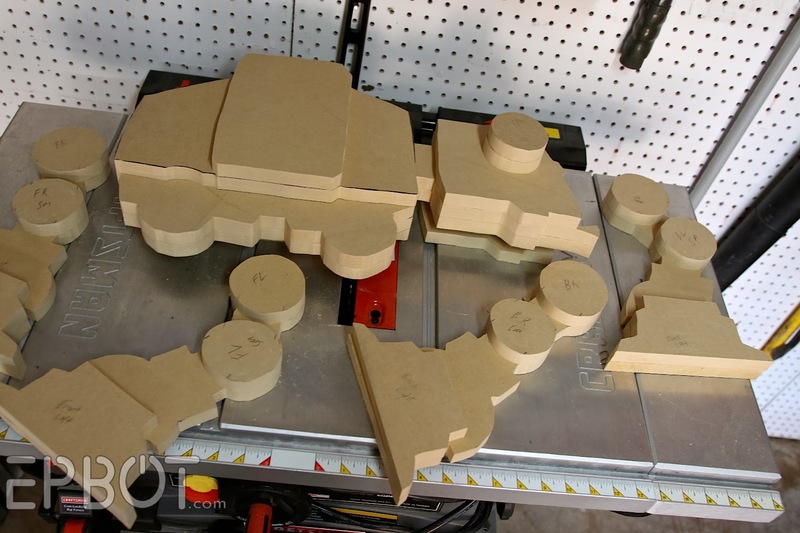 I'm curious because I was wondering about using MDF for a dragon rocker and wasn't sure it was suitable for that kind of thing. I actually gasped in delight when I saw the AT-AT on the rockers! When you are done, please post the pattern. I'm new around here. But oh. my. gosh. That rocker is absolutely amazing. Super creative. Can't wait to see it finished! I love, love, love the AT-AT! So much so that I've come out of lurk-dom to comment. Love! That's it! 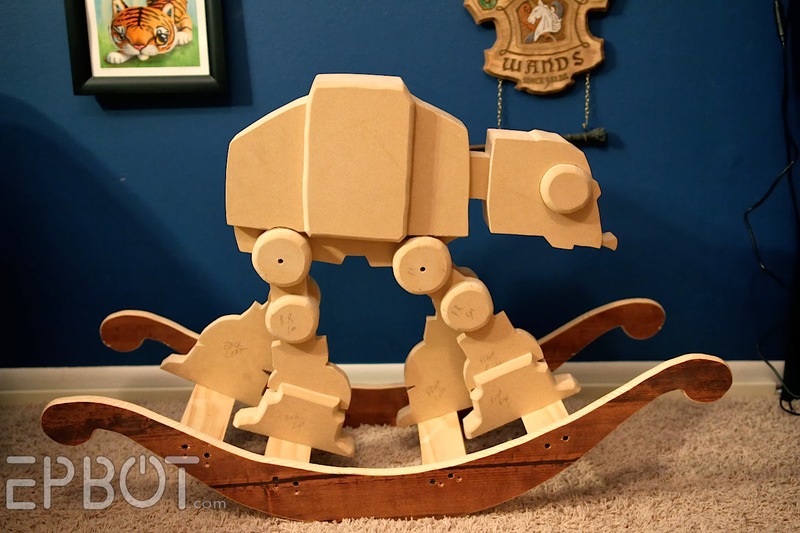 I've officially decided to put a AT-AT rocker in my future children's bedroom! It'll go perfectly with a Death Star mobile. There has to be something cute you can do with the muffin legs, my little brain is trying to come up with something now (if i had a kid i would paint them up like cup cakes and add them to the "play kitchen") Or.. i could just paint them up like cupcakes and put them on my desk at work cause that would be freaking epic.. who doesnt love cup cakes..
*Best Vader voice* Where are you hiding the plans? Rocking AT-AT is amazing! You won the internet today. I have an idea for the "muffins": paint them to look like actual muffins (or cupcakes) and put them in a little basket in the kitchen to decorate. If you finish the At At, I want to buy the plans!! So it is August and I just found this via Pinterest. LOL A little late to the party but loving it all. 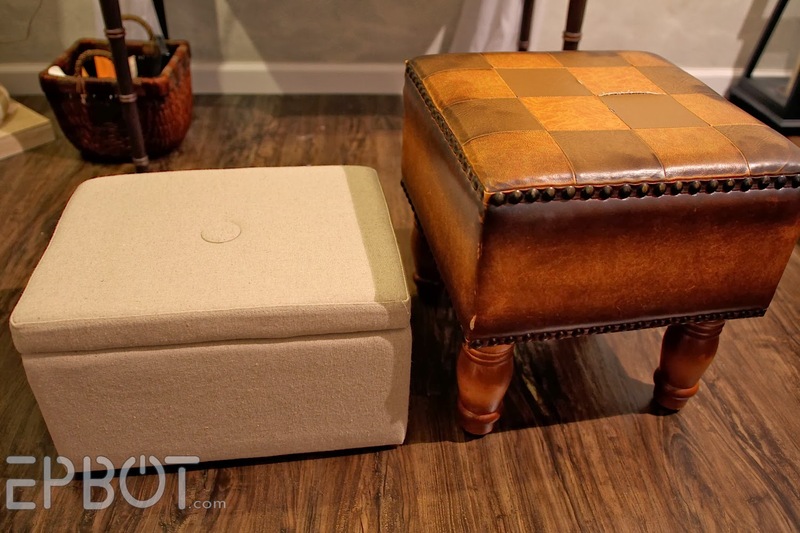 I really enjoy how you fixed the short ottoman problem. Did you do anything exciting with the top part?